Shannon Dunnigan is the System-Wide Monitoring Program (SWMP) Manager at the GTM Research Reserve. She attended Florida State University for her B.S. degree and the University of North Florida for her M.S. Her background lies within studying the ecology of fishes, particularly how habitat setting affects their abundance, distribution, and behavior. In graduate school she studied the habitat value of an artificial intertidal oyster reef constructed within the Research Reserve on juvenile fish and benthic macroinvertebrate assemblages. With a love for large data sets, an understanding of the importance of water quality for the distribution of estuarine organisms, and a deep obsession with organization and color coding, she assumed the roll of the SWMP Manager at the GTM Reserve where she oversees the long-term weather and water quality monitoring of the Reserve. 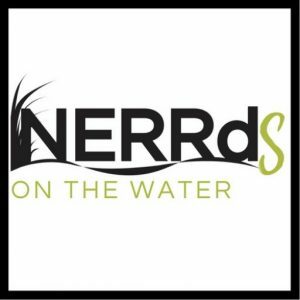 She also serves as the Webmaster and creative lead for the NERRds blog! Nikki Dix is the Research Director at the GTM Research Reserve. She grew up in the sunshine state, attended Florida State University for her B.S. degree and the University of Florida for her M.S. and Ph.D. Her research interests involve understanding how ecosystems respond to natural and anthropogenic change with the intent of informing natural resource management. In graduate school she managed the nutrient component of the Research Reserve’s System-Wide Monitoring Program (SWMP) through a contract with the University of Florida. With support from a NOAA Graduate Research Fellowship, Nikki used SWMP data, laboratory-based experiments, and oyster reef sampling to investigate the impacts of hurricanes and eutrophication in the GTM estuary. After graduating, Nikki spent two years as a postdoctoral researcher at Harbor Branch Oceanographic Institute in Ft. Pierce, Florida investigating relationships between phytoplankton and zooplankton in the Indian River Lagoon. Pam Marcum is the Lead Biologist at the GTM Research Reserve. She attended Arizona State University for her B.S. degree and Nova Southeastern University for her M.S. She has worked as a field biologist in several of Florida’s coastal estuarine systems. In South Florida she collected, identified, and measured fish and invertebrate specimens for a long-term monitoring project, in addition to, conducting vegetation surveys of seagrass beds. Her love of coastal ecosystems and working on the water brought her to the GTM NERR where she oversees the biological monitoring of marshes and oyster reefs within the GTM estuary. Katie Petrinec is the SWMP Data Specialist at the GTM Research Reserve. She earned her B.S. from Jacksonville University in Jacksonville, Florida. She worked for Tree Hill Nature Center, a small non-profit in the heart of urban Jacksonville for five years before relocating to Madison, Wisconsin to work for two years as a Microbiologist for the University of Wisconsin Veterinary Diagnostic Laboratory. She worked in the Transmissible Spongiform Encephalopathy (TSE) Laboratory performing multiple stages of diagnostics including analyzing specimens for the presence of prion pathogens. She then relocated back to Florida and began working at the GTM NERR serving as the SWMP Manager until 2013. In 2014, Katie earned her A.S. in Computer Programming and Analysis and began working as the SWMP Data Specialist. She now is responsible for data management and analysis of the water quality, weather, and nutrient components of SWMP. She performs the QA/QC reviews and carries out quarterly and annual submissions on all SWMP data collected at the GTM NERR in coordination with standards laid out by the NERRs Centralized Data Management Office. She has also been working on putting together a 10 Year Report on the SWMP data from the GTM NERR. J. Silas Tanner is the System-Wide Monitoring Program (SWMP) Technician at the GTM Research Reserve. The SWMP technician conducts water quality sampling and oversees the maintenance of the monitoring instruments used by SWMP. He received his bachelors in Coastal Biology from the University of North Florida along with a minor in Environmental Studies. While at UNF, he studied the effects of oyster harvesting on shell availability, in the context of sustainable fisheries, within the St. Augustine area.